Great for outdoor spaces, the stylish 4' and 6' Cantilever Bench provides durable and aesthetically pleasing public seating. Contoured for comfort, the steel bench seat features a die-formed wave pattern and smooth edges which perfectly suits the strong frame. The unique, load bearing cantilever frame is crafted with two 'T-styled' 2-3/8"O.D. round steel tube legs and arm rests. 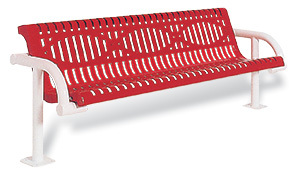 A resilient, non-corrosive thermoplastic powder-coating protects the bench from the ever changing seasonal conditions while maintaining its original beauty and form. Create a customized bench area and when seating demands grow, easily expand with 4' and 6' add-on lengths.